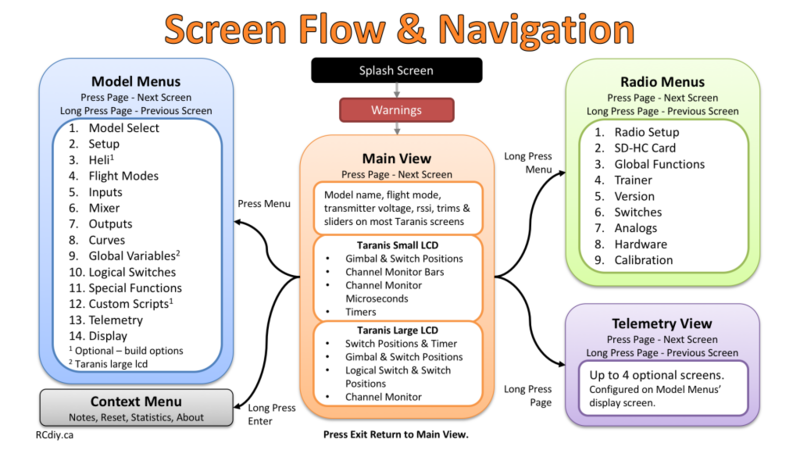 This section is a brief overview of the screen types and how to navigate them. There are over 30 possible screens that you may encounter but only a small representative sample is shown here. For details of all the screens you may encounter in a section there will be links to that section’s documentation. Press and release a button in under a second. Press until screen changes, about a second, an then release. Turn the Scroll Knob or press (+) or (-) buttons. Long press to change from main view to telemetry view. Long press to go back a screen when in model or radio menu views. Press to change from main view to model menu view. Long Press to change from main view to radio menu view. Press to go back from one view to previous view such as from telemetry view to the main view. Press to stop editing text fields such as names. Press to edit/change a value/field. Press to stop editing when editing some settings such as the timers. Press to select character and move to the next when editing text fields such as names. Long press to bring up a context menu. Turn clockwise to selection (cursor) forward or down. Turn counterclockwise, left, to move selection backwards or up. Scroll up (+) and down (-). Pressing both (+) and (-) together will invert a value. When the transmitter is turned on the screen displays information. When the transmitter is powered on the screen displays an image for a few seconds. The appearance and duration is configured on the radio set up screen. The image can be changed using Companion when the firmware is flashed on to the transmitter. When the transmitter is turned on and when a model is selected and loaded the firmware does a number of checks. 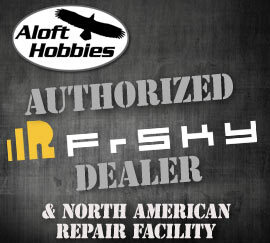 These checks may result in a number of different warning screens being displayed after the splash screen. The warning screens are cleared by either fixing the condition that resulted in the warning or pressing EXIT. The throttle stick is not at idle (all the way down). To clear this screen move throttle the stick all the way down. The shown switches, knobs and sliders are not in the correct position as configured on the model setup screen. To clear this screen move the switches shown to the correct positions as shown. The failsafe settings are on the model setup screen. To clear this screen press EXIT but configure the failsafe on the model setup screen to prevent this warning from appearing again. To clear this screen press EXIT but place the correct version file on the SD Card along with ensuring the SD Card has the correct content to prevent this warning from appearing again. Press PAGE to change and cycle through screens. 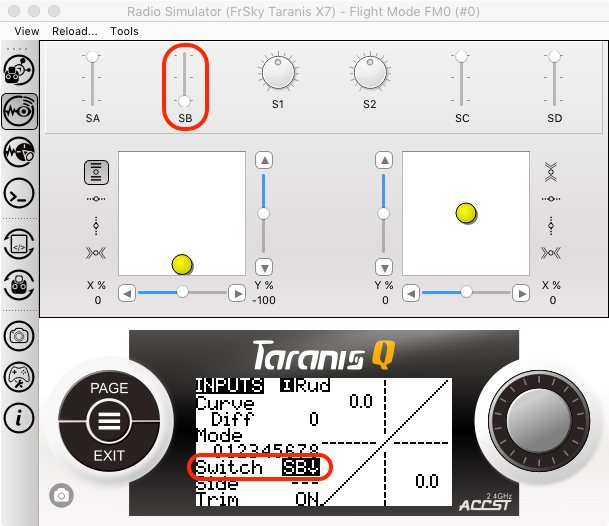 The following screens are examples from a Taranis Q X7 series & X9 series of transmitters. Long Press PAGE when the main view is displayed to access the telemetry view. Press PAGE to change and cycle through the screens. Press EXIT to go back to the main view. Press Menu when the main view is displayed to access the model configuration view. Long Press PAGE to to change and cycle through the screens in reverse. Turn the Knob or use (+) (-) to scroll up and down. Long Press Menu when the main view is displayed to access the model configuration view. Most of the radio and model screens have settings that can be changed. To scroll up and down use the knob or (+) (-) buttons. Press PAGE to co to the next screen. To edit a filed scroll to it using the Scroll Knob or (+)(-) buttons. Scroll to change values, use the knob or (+) (-) buttons. Scroll to change the characters. To stop editing press EXIT or repeatedly press ENTER till the cursor moves past the last character; The whole field is now selected when editing stops. The cursor will start to blink on the whole field. To stop editing press EXIT; The cursor stops blinking. While editing a switch setting moving the switch on the transmitter will auto populate that switch to the setting being edited. In this example switch B (SB) has been moved to the down position (SB↓).